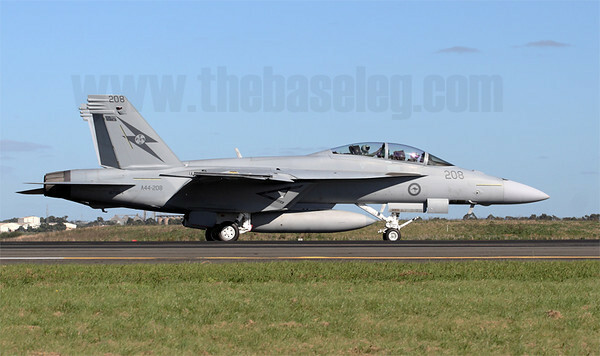 The Royal Australian Air Force (RAAF) will welcome home the last four Boeing F/A-18F Super Hornets it currently has on order with a flypast of up to 20 Super Hornets around South-East Queensland this Friday the 21st of October. Sixteen aircraft will depart RAAF Base Amberley between 10 am and 10.30 am and will fly in a loose formation to a point off North Stradbroke Island, where they will form up and fly south, crossing the coast at Southport before flying down the Gold Coast to Tweed Heads. The armada will then fly out to sea and reform at a point off the Sunshine Coast where it will join with the four new Super Hornets. The formation will fly south from Noosa Heads down the Sunshine Coast to Brisbane where it will then fly over the CBD en route to Ipswich and RAAF Amberley. It is expected to pass over the base at 11.30am. The formation will be accompanied at intervals by up to two Hawk Mk127 lead-in fighters. Full details on the RAAF's Facebook page. The place to be, Steve, would be in the rear cockpits of any of the Super Hornets, or the 2 Hawk 127s!